Tazo® offers teas with a twist for deliciously unique flavours. Calories . 0.0 . - . Pairing bold black tea with blossoming florals, Tazo Earl Grey Black Tea offers intriguing taste your guests and employees seek. This black tea is fully oxidized to draw out its rich flavour and aroma, and it is blended with the lavender essence of bergamot oil for bright floral and citrus notes. 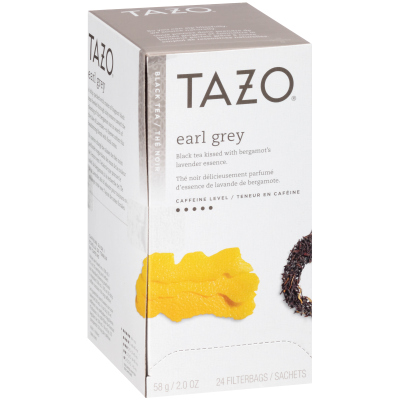 Ideal for restaurants, cafes, hotels, and office environments, this package includes six boxes of 24 individually wrapped bags of Tazo Earl Grey Tea. Whether you're an office manager looking to ignite the creativity of your workforce, or a café owner in search of a deliciously unique flavour offering, you will love serving this blend that inspires joy and wonder with every sip. Place one tea bag in a mug. Bring fresh, filtered water to a boil and let cool slightly. Pour 8 fl. ounces of the boiled water over the filterbag in the cup. Let it steep for 5 minutes - wait patiently for perfection. Squeeze bag and remove.